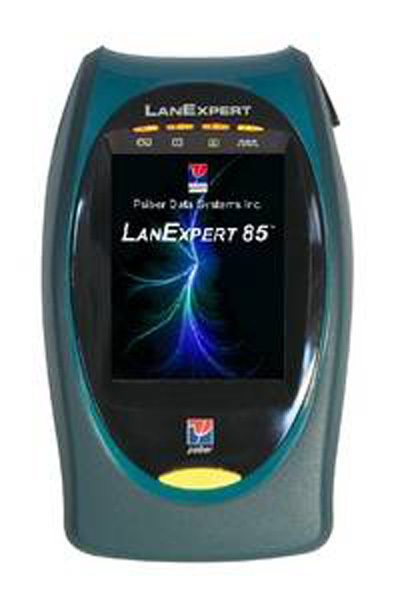 The LanExpert 85 network analyzer provides expert assistance for all tiers of LAN installers, technicians and managers working with either copper or fiber media. The LanExpert 85 uses SFPs to change between copper, Single mode and/or multimode fiber SFPs. The LE85S includes (2) Single mode and (1) 10/100/1000BASE-T SFP modules. The Inline Mode allows users to non-intrusively monitor network traffic (10/100/1000BaseTX) to identify protocols, port usage, VoIP statistics and network utilization. The LANEXPERT can capture and store up to 10,000 packets with user defined filters for detailed analysis in the field or downloaded over the network or to a USB flash drive. Using either RJ-45 port, tests including Ping, Link, Trace Route, DHCP and Discovery are used to quickly identify network problems. The LANEXPERT can generate up to 100% traffic loading with control of packet rate and size to demonstrate network performance at various traffic levels.Additionally, a stress test that generates traffic and measures performance metrics, in accordance with RFC 2544, is also provided. The stress test can be conducted using the two independent ports on a single unit or used with a second unit located remotely on a network.